Which Size of Garlic to Buy? Garlic varieties can vary quite a bit in size. For example, Elephant Garlic bulbs can reach sizes between baseball and softball dimensions in your garden. See individual descriptions on our Garlic Varieties page for more about how the varieties differ in size. For example, let’s look at one variety, such as the German Red. Each year, German Red (and all varieties) has some huge bulbs, some medium bulbs, and a few small bulbs. but the medium-sized bulbs are still awesome garlic! A comparison of bulb size and weight, using German Red as an example. 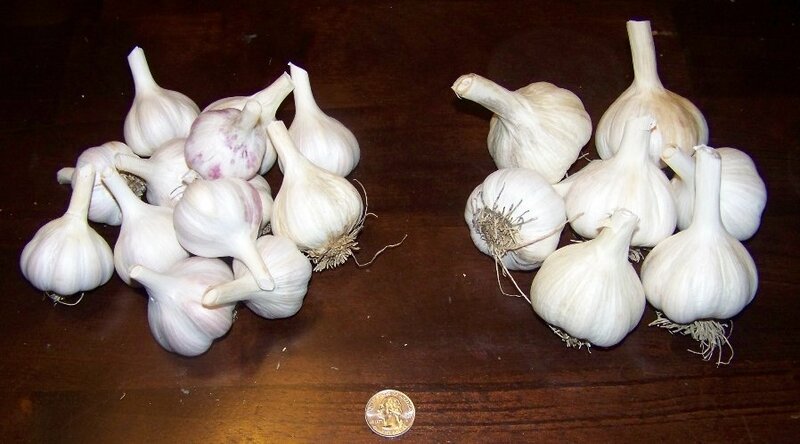 On the left is one pound of German Red, average-sized bulbs. On the right is one pound of German Red, large-sized bulbs. The largest bulbs in each variety are recommended for planting if you want your garden’s harvest to consist of really large bulbs with large cloves. The larger bulbs are generally over 2″ in diameter, although some are 3″ (depending upon variety). An example of large-sized bulbs is the grouping on the right in the photo above. Average-sized bulbs (generally up to 2″ in diameter) are economical for those wanting more cloves (because our garlic is sold by weight, and not by the number of the bulbs or cloves). If you want to plant in your garden with the harvest consisting of average-sized to large-sized bulbs, the smaller-sized bulbs may be better for you. An example of smaller (average-sized) bulbs is the grouping on the left in the photo above. Small-sized bulbs are the ones we eat here at home, as well as the average sizes. We do not typically offer the small bulbs for sale. How To Choose Your Favorite Garlic Varieties? When Can I Buy Garlic? What is the difference between Seed Garlic and Food Garlic? How Much Garlic Should I Buy? How To Grow Garlic From Seed?